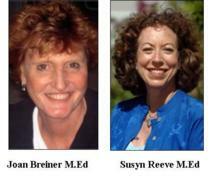 Joan Breiner and Susyn Reeve have helped thousands of people live their dream for a happier life. They have a wealth of experience starting with their Masters Degrees in Counseling and Education. Joan is Executive Director of the National Association of Self Esteem and teaches Self Esteem and Empowerment. Susyn is the author of Choose Peace and Happiness, Gift of the Acorn, and co-creator of WITHForgiveness.com. She is an InterFaith Minister and has apprenticed with don Miguel Ruiz, best-selling author of The Four Agreements. Through The Mind Manual System they have created a ground-breaking empowerment program. Starting with learning how the brain works then using their exercises, affirmations and meditations for 21 days to harness the power of your mind. The results will be a happier more desirable life. See for yourself - Download a Free Mind Manual System Lesson Now.